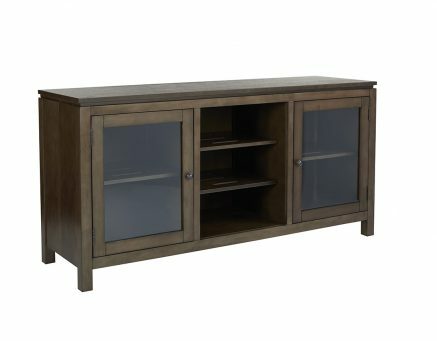 The Spokane Folding TV Console has the potential to craft the entertainment center of your dreams. This wooden cabinet is outfitted with a side folding construction that gently opens with two storage doors. The Spokane Folding TV Console has the potential to craft the entertainment center of your dreams. This wooden cabinet is outfitted with a side folding construction that gently opens with two storage doors. Inner storage is widely spread with fully adjustable shelves and open storage compartments. Allowing you to fit a variety of devices to enjoy more of your entertainment. Sturdy, tidy, and a smooth finish are qualities that guests will admire while watching your television. The first product for your entertainment utopia is finally here.